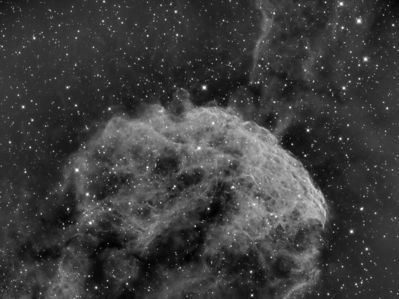 Found in the constellation Gemini, the Jellyfish Nebula, also designated IC 443, is a large supernova remnant. The emission of the nebula is due to the excitation of hydrogen atoms as the rapidly expanding shell collides with the surrounding molecular gas. This hydrogen-alpha image shows the turbulent nature of the nebula as the resultant shock wave expands. Image taken with a Takahashi CCA-250 f/5 astrograph and QSI683wsg CCD camera (Astrodon 5nm H-alpha filter) on a Paramount ME in Mayhill, NM on the nights of the 23rd, 24th January 2018. Total of 7 hr exposure (21 x 1200 sec lights @ -20 degrees C; 24 darks; 128 bias; 128 flats). Processed in PixInsight 1.8.5.1353 Ripley (x 64).